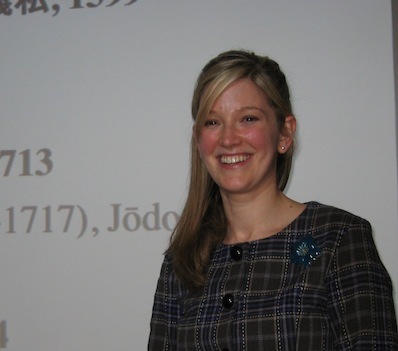 “Making Sense of the Blood Bowl Sutra: Gender, Pollution, and Salvation in Buddhist Sermons from Early Modern Japan,” was the Institute of Buddhist Studies’ Spring Numata Lecture topic presented by Dr. Lori Meeks of University of Southern California. Dr. Meeks explained that sometime during the late fourteenth and early fifteenth century, several variants of an indigenous Chinese sutra known at the “Blood Bowl Sutra” were transmitted to Japan. The short sutra scripture teaches that women are fated to fall into a special hell known as the “Blood Pond Hell” in retribution for polluting the earth with the impurity of their reproductive blood. By the eighteenth and nineteenth centuries, temples throughout Japan actively promoted the cult of the Blood Bowl Hell as a means of saving women. Dr. Meeks presented two early modern commentaries on the text in an effort to understand how priests presented the teachings to a new audience of lay men and women. Dr. Meeks received her Ph.D. in East Asian Religions from Princeton University in 2003. Her research focuses on the social, cultural, and intellectual Histories of Japanese Buddhism, in particular, clarifying the roles of women as consumers and practitioners of Buddhism in the Heian and Kamakura periods. Audio and video of her talk can be found on our podcast. For more information about past and future Numata Lectures, please visit our News & Events page.